Heavy-duty Color Auto shutter backup camera with Infrared LED. LintechCo: Leading Chinese B2B Night Vision Waterproof Auto Shutter Rear View Reverse Camera Supplier. The Auto shutter backup camera is an extremely well made, heavy-duty, full-color Auto shutter backup Camera suited for large commercial transport vehicles, trucks and large plant vehicles. This clever system automatically switches on, and the shutter opens when reverse gear is selected or by direction lights. 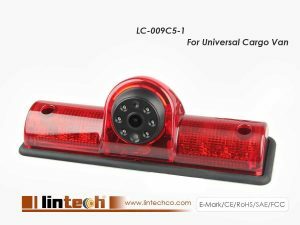 The wide camera lens has been designed specifically for the purpose of vehicle reversing, giving a good field of view to make reversing very easy and safe. This extra heavy-duty camera also has built-in Infrared LED’s for picture support in the dark AND automatic heating when below -5°C.